…and how to know when you see it. One of the most overused terms in the Christian education lexicon is the expression “worldview.” And although it is frequently used, it is almost never defined. We are told how important “worldview” is. We are supposed to have a “worldview” and make sure we teach “worldview” to our children. We are warned about other “worldviews” different from our own “worldview” and told that we must learn to distinguish our “worldview” from all the other ones. Or so the rhetoric seems to run. But exactly what is a “worldview”? How do we know a good one when we see it? And how did this expression make it into our vocabulary anyway? The expression “worldview” originated in German with the word Weltanschauung. It first appeared in the eighteenth-century German philosopher Immanuel Kant’s Critique of Judgment. A worldview, or Weltanschauung, is a sort of unified field theory of existence. It is not just the set of beliefs we happen to have about God, the world, and ourselves, but the fundamental assumptions that lie behind most of our beliefs—the small set of basic presuppositions that underlies the rest of our thought. 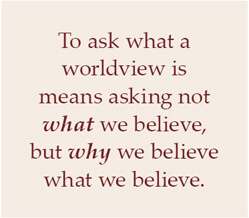 To ask what a worldview is means asking not what we believe, but why we believe what we believe. While we may disagree with Kant or Freud’s worldviews (Kant’s involved a radical bifurcation between our mind and the world, and Freud’s worldview was based on his theory of psychoanalysis), we would do well to learn from the care with which they tried to define the term itself. To ask “What can I know?” is to ask a question about epistemology, from the Greek word that means the “study of knowledge.” This question has to do with the True and how we can know it. To ask “What may I hope?” is a question about our affections and whether they are rightly directed. What do we long for and what should we long for? It is also a question about aesthetics, the study of the Beautiful, or the Sublime. These first three questions would seem more fundamental than Kant’s fourth question—”What is man?”—since they have to do with the three most fundamental things: the True, the Good, and the Beautiful what the ancient philosophers called the “Transcendentals”—the universal characteristics of everything that exists. Still, the question “What is man?” seems a very fundamental one to us, since we are all human beings. Is there anything missing here? I think there is, but we will have to go back further than Kant to find it. We will have to search beyond the eighteenth century and go back to the Middle Ages, and ultimately to ancient times, in order to find one more question that is behind them all. It is the question “What is reality?” To ask this question is to ask a question about ontology (literally, the “study of being”) or metaphysics. Kant did not give this one in his list, perhaps because he came after René Descartes, who set this question aside in the sixteenth century when he re-centered human thought away from reality to the self. Descartes is considered the first modern philosopher because he changed the way we think. To him, all knowledge of reality must begin with the self. Descartes inverted the ancient order in which ontology came first and psychology last. Have we left anything else out? Perhaps so. 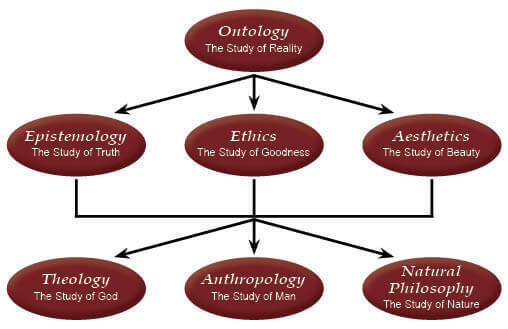 If we are going to include anthropology, we should probably also include theology, the “study of God,” and natural philosophy, or science, which is the “study of nature,” since these three things make up the basic elements of all that is. What is a worldview? It is your view of what, at bottom, reality is, followed by your fundamental beliefs about the True, Good, and Beautiful, and lastly, who and what God, man, and nature are. Furthermore, if we are wise, which St. Thomas Aquinas defined as the ability to “order things rightly,” we should see that these questions form a hierarchy: The nature of reality (ontology) is the most fundamental thing, second are the characteristics of reality (the Transcendentals), and third are the elements of reality (God, man, and the world). It is a progression—from the most fundamental to the relatively less fundamental. Our view of the Transcendentals will be essentially affected by our ontology, and our view of God, man, and nature will be fundamentally affected by our view of what reality exists and how reality exists. Now that we know this, we can answer the question many Christian educators ask (and ask their students to ask): “What is the Christian worldview and how does it differ from other worldviews?” We now have seven ways to confidently answer this question, and if we use these seven ways, we will discover what the Christian worldview is. There have been three main views on the nature of reality over the course of Western thought. The first is Plato’s view that the essences of all the things in this world exist in Heaven. Humans exist in the world, but human nature exists in Heaven. Horses exist in the world, but “horseness”—the horse essence or nature universal in all horses—exists in Heaven. Trees exist in the world, but “treeness”—the essence common to all trees—exists in Heaven. The things in this world are imperfect imitations of these Heavenly essences, or forms. In this sense, the things of this earth—men, animals, plants, etc.—are less real than the really real things in Heaven. The late medieval thinker William of Ockham, on the other hand, questioned the existence of any essences at all. There are no human, animal, or plant essences, he said, and we call the things by these labels (man, horse, tree) only because they happen to have similar outward features. The classical Christian view on ontology settled on by the early Middle Ages was Aristotle’s view, closer to Plato than to Ockham, in which (unlike Ockham) the essences of things were considered to exist, but (unlike Plato) resided not in Heaven but in the things themselves. Human nature is in every man, horse nature is in every horse, tree nature in every tree. The essences are, indeed, the really real things, put there by the Creator. The essences are intrinsic to the things; they are what makes things what they are. The Greeks and Romans believed there were three ways to know truth: through reason, through the senses, and through divine revelation—but the true God had not revealed Himself to them. Christianity too acknowledges these three ways of attaining truth, but because it is in possession of the true revelation of God, its knowledge is superior to the knowledge of the ancients. Still, Christianity does not reject reason in favor of revelation, since reason is part of the reflection of the image of God in man. Rather, it considers that both reason and revelation strive for the same truth. What about ethics? Modern ethics is divided between rule based ethics (deontology) and consequentialism. We either believe with Kant that ethics consists in following rules, or with John Stuart Mill that the rightness of our actions lies in their good consequences. Neither is a full view of morality. The reigning view of ethics before the Enlightenment was what we now call “Virtue Ethics,” which says that an action is right if it is in accordance with our natures—natures that were effaced by the Fall but not erased; damaged but not destroyed. This is the classical Christian view. According to this view, we are created with an intrinsic nature and purpose. To act according to our nature and to accomplish the purpose we were made to serve is to do right, and to violate our nature or interfere with the purpose in us is to do wrong. The aesthetics, like truth and morality, are, in the Christian view, objective and universal. The modern view that “beauty is in the eye of the beholder” is only a very recent one historically speaking. It is attractive to us because the standards we need to determine the difference between those things which naturally appeal to our imagination and those that repulse it are not cut and dry. But just because standards of judgment are hard to determine does not prove that they don’t exist. Beauty and the sublime exist, despite the difficulty in saying exactly what they are. Christianity agrees with Plato, who thought that the True, the Good, and the Beautiful all find their ultimate origin in God. It is no accident that the catechisms of both St. Thomas and Martin Luther are divided into three sections—sections that mirror the order of Transcendentals and the question that accompanies each. To the question “What can I know?” Christianity answers with the contents of the Apostle’s Creed; to the question “What should I do?” Christianity answers with the litany of the Ten Commandments; to the question “What may I hope?” Christianity answers with the Lord’s Prayer. Theology, the study of God, becomes possible only through the availability of divine revelation in the form of the Bible since it reveals to us specific truths from which to work. It also makes anthropology a much easier science, since it tells us about the nature of man, a creature created in God’s own image. Likewise, our natural philosophy will be informed by the idea that the order of the world is the result of an Orderer, and that the mysteries we see in nature are ultimately resolved in the Being who made it. God is at once the most fundamental aspect of the Christian worldview since He is the ultimate ontological reality and the object of our theology. He is at the core of our study of human nature because it is a nature made in His image and likeness. He is also the operating principle informing our study of nature since the essences of things in the world were of His own design.